Headlines: Great fishing over the last two weeks. Good numbers of anglers have reported excellent fishing particularly on bait and fly. Trolling is on the improve also. There has been some excellent dry fly fishing in the area. There hae been some good termite falls and numbers of fish have been gorging themselves on these. The upper Eucumbene has started to fish well. We have had some good rain over the last week and this will keep river levels up for a good time to come. The Murrumbidgee has also produced some good dry fly fishing with one angler reporting landing four nice Browns on Adams and Klinkhammers. The Thredbo has been fishing quite well also with nymphs and dries. as opposed to the black ones that I had mostly caught till now. 2 of the fish caught were polaroided. No browns seen up there yet. Lake Eucumbene:- Fly reports from Eucumbene have really improved with some great reports of fish on Termites and quite a few midges starting to show as the water rises over some of the grassy bays. Seven gates has had fish moving in numbers on some evenings and a midge pupa or stick caddis will work well when fished with the slow dancing retrieve. 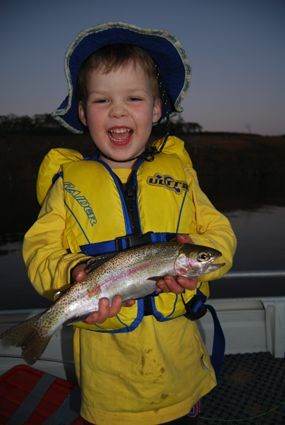 *Matt Daniel took his son Tom out in the boat for a session on Rainbows on termites. There were fish rising all over the lake and they managed seven nice fish. Tom pictured below with one of them. Lake Jindabyne:- There are some excellent Browns cruising the bays on dark at present. I have seen some photo's of fish that were 3.5kg plus taken this week on woolly buggers. While you won't catch a bag limit of these fish between the Rainbows and the odd big Brown there is some very exciting fishing. The water has risen over some really nice grassy areas and there are midges starting to build in numbers. Eucumbene:- With the rising water launching will become progressively easier. Launching access is available at Old Adaminaby, Anglers Reach, Dam Wall, Buckenderra. For larger boats Old Adaminaby's ramp is still the best option and as the depth increases will make for less headaches. A 4WD can still be an advantage with the larger boats. Jindabyne:- With the rising levels the weed beds are the place to troll. Being in close is the key as is an early start. If you really want to catch a fish being on the water as the light starts to improve is essential. If you hit the water at eight o'clock you have missed the peak bite time. As with Eucumbene, Tassies and shallow running minnows are the go in close. small Rebel Crickhoppers work well here too. Baitfishing :- Bait fishing has been very good in Eucumbene with good Browns and Rainbows coming in from the Old Adaminaby and Seven Gates area. Powerbait and Scrubworms have been the best baits. 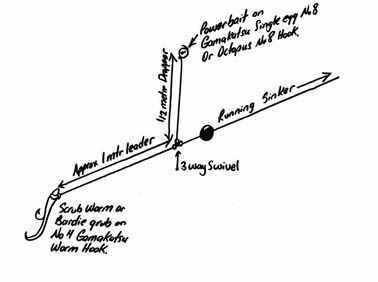 Stimulate has been an excellent addition to Scrubworms and those anglers using it have reported a jump in their catch rates. *Tom Had a good couple of nights at Seven Gates got 11 fish in all, 9 rainbows (to pick a size to represent all of them I would say 3/4lb) and two browns (the browns were a better class of fish 1.5lbs). Both browns taken on scrubbies, the rest were taken on a mix of Power bait (Rainbow), and African night crawlers (wood grubs drew a blank). Classic filling dam stuff, out on the flats with the water advancing into the weeds, action started on sun down and continued until we pulled stumps, earliest fish caugh 5:15pm, latest fish caught was 12:30 am. Hint: have bait on your lines. Heh hem .. I suspect we would have had even better results if we had been as attentive to our lines as we were to our Heineken kegs. Everyone fishing caught fish and got to take a couple each home, got to be happy with that. The furphy going around was that the lake is only going to be rising for two more weeks so I shall encourage everyone to get up there.